Without getting too Aristotelian, with marketing, the whole is most certainly more than the sum of its parts - when it's done right that is. That's the essential essence of integrated marketing - that by coordinating messages across channels the results from increasing brand awareness, familiarity, favourability and purchase intent are far higher than when taking a less integrated approach which fails to coordinate. With the introduction of a whole host of new digital marketing channels over the past decade, such as Instagram, Snapchat and Pinterest as well as existing digital platforms like Google, Facebook and Twitter, the integration of marketing channel has never been more difficult or more important. In this article, I will review what integrated marketing means today and look at examples of good and less good practice. Traditionally, definitions of integrated marketing focus on integrated marketing communications (IMC), but we believe these are no longer fit for purpose, since they imply an old media mindset of campaigns with broadcast and push communications that are one-way and not interactive. Digital media and the web have brought us the opportunity to share via social media (including UGC, user generated content) and create immersive experiences on websites and in mobile apps. We can also personalise across ads, website and email through techniques like re-targeting and website personalisation. We also need to plan our communications around cross-device usage to reach what comScore rightly highlight as the Multichannel majority and to consider we should look beyond burst campaigns to longer-term continuous online visibility as people and businesses look for our products, services and brands, which Gartner have called Two-speed marketing. "A strategic approach to integrating communications and interactive experiences targeting defined audiences and individuals which coordinates all aspects of marketing of a brand including Paid media (offline advertising, direct marketing and online display and programmatic); Earned media (Organic search fuelled by content marketing, PR and online influencer outreach) and Owned media (including social media, on-site UX, customer service and direct messaging through email and mobile) in order achieve consistent messaging customised where possible by channel which presents a unified and seamless experience to consumers across the customer lifecycle or path to purchase". This builds on this definition of Integrated marketing from the DMA which also emphasises the use of communications and experience together. That's not to say integration stops at coordinating across individual digital channels. Many more traditional ad mediums have retained their effectiveness, and also need to be integrated with digital campaigns. TV has proved particularly resilient in this regard, as shown by the chart from thinkbox TV below and the persistence of offline media as a high percentage of investment in IAB data on ad and media spend . Different channels have different strengths and weaknesses, and different types of content suit different channels better - Twiter is good for short, witty and pithy messages, whilst Pinterest is great for content related to design, and aspirational content works best on Instagram. So why not play to each individual channels strengths and design marketing for that channel specifically, rather than attempting to integrate all channels? The answer is customers don't care enough to pay attention to all your different messaging, and by not using one clear communications strategy to amplify your brand, your message will simply be lost in the constant stream of content that all consumers are subject to every day. For example, the brand storytelling report showed that 85% of consumers couldn't name a memorable story told to them by a brand. That means all of the thousands of brands storytelling efforts were completely forgotten by over four out of five people. You may think your marketing is the best thing in the world, but the reality is pretty much everyone is going to forget it very quickly. To make an impact you have to coordinate messaging. Have you ever wondered why McDonalds are constantly advertising? Everyone knows who McDonalds are. Everyone knows what McDonalds offer and there is one on every street corner. So why do they advertise? Because there is power in reminding consumers about your brand, even if they already know that it exists. And of course, they may want to change perception of it's values and what it offers. This is why consistent messaging across channels is so critical. Without it, your message will fail to make an impact and you will just be yelling into a gale. Really good integrated marketing is about more than just having the same slogan, ident and brand colours splashed across every marketing channel. It weaves a coherent story through everything the brand does. One of the best examples of this is Compare the Market's classic 'Compare the Meerkat' campaign, which has been running for over 8 years. It integrates social media, search, TV and more, whilst using real Meerkat dolls as gifts to keep compare the market's brand awareness high. By using the same set of characters across all mediums, compare the market have successfully integrated all their marketing channels and managed to create one of the most memorable and long-lasting ad campaigns of all time. Another great example of an integrated marketing campaign is Coke's 'share a coke with' campaign, which used unified messaging across TV, Social, Outdoor and Display leading to a 7% uplift in Coke consumption by the target demographic, making it one of the most successful Coke campaigns in history. Integrated marketing is hard to get right, and whilst all big brands attempt it, not all succeed. 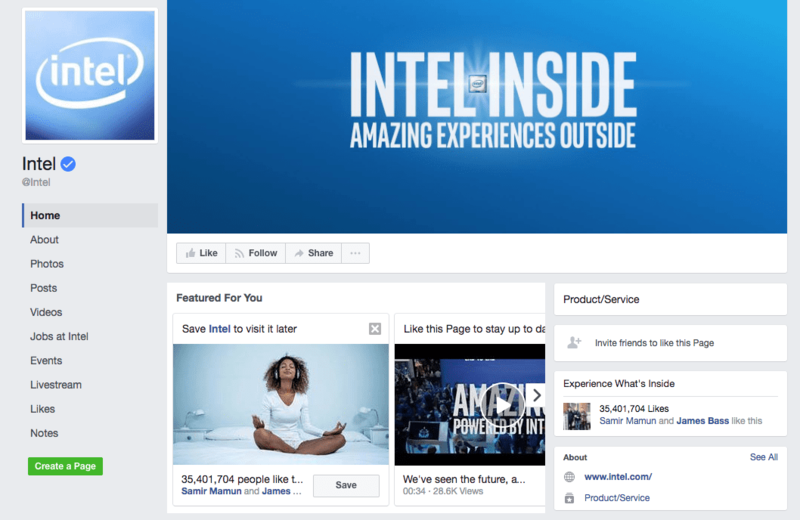 Even multi-billion dollar brands like Intel get it wrong. We looked at their website and social media channels, and not only did they not match at all in terms of messaging, neither featured Intel's official slogan. What's the point of having a slogan if you don't use it? Looking at their website below, there is no mention of their current brand message; 'Experience What's Inside'. Nor does their social media match what is on the website. The social media profile picture using different shading to the logo on the website, and the slogan used on the cover images is neither the official slogan nor does it appear on the website. Intel's failure shows it's hard to get integrated marketing right, given even huge brands manage to make a right mess of it. To successfully integrate your marketing so all channels are pulling in the same direction, you need to plot all customer touch points with your brand across the customer lifecycle. This lets you form a list of channels you'll need to integrate and align with the same messaging. Our integrated lifecycle marketing diagram below should help you consider the options such as retargeting. It plots 26 marketing channels and activities across the customer lifecycle. Click on the diagram for an enlarged version. Aligning your messaging across all forms of content marketing is also crucial, in case certain content types not chime with the overall brand. Here you can use our content marketing matrix to see what types of content you can use and again create a checklist of mediums which you need to assure the messaging is aligned across. If you want more advice on how to integrate your marketing efforts, we've produced a free guide to integrating marketing. You won’t be able to compete if you don’t have the right types or levels of investments in people resources, media or tech to run different digital marketing techniques against intense competition. This guide is designed to help you integrate marketing channels and give you an overview of 10 techniques that need to be in place to create an integrated marketing strategy by 2020 .